I don’t buy reluctant readers; I think anyone who doesn’t enjoy reading either struggles with it, which makes it unenjoyable, or simply hasn’t found the right story yet. This has proven itself over and over to me both as a parent and a teacher, and I’ll stand by it until I see one case otherwise. Vande Velde likes to take on fairy tales with problems, especially of a plot nature. Why are people so stupid in fairy tales? She wonders. 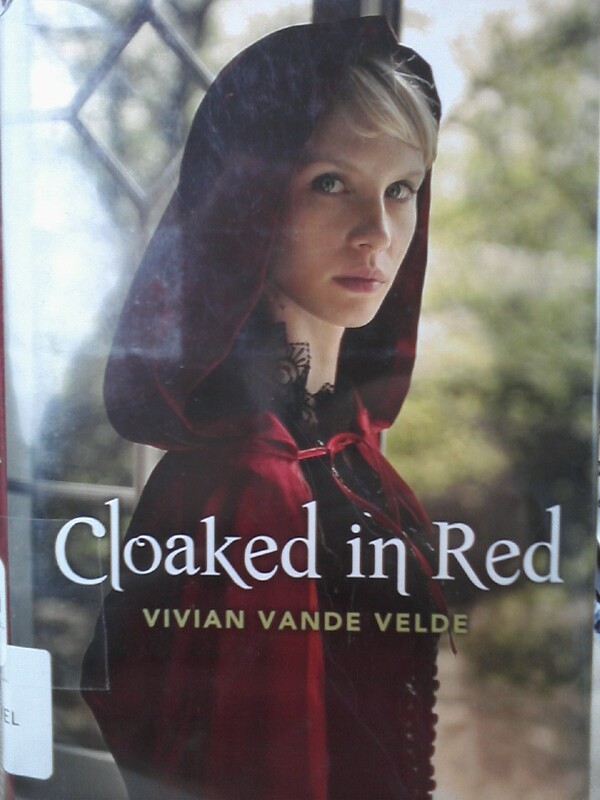 To explain why a woodcutter would just suddenly leap into a house and cut open a cross-dressing wolf, or why a loving parent would send a little child into the woods all by herself, and many other conundrums, Vande Velde penned the collection of short stories, Cloaked in Red. Readers will delight in these fun and fanciful tales. Whether Red is a crafty girl, a poor girl hoping to escape her parents, or a dimwitted dwindle head, she’s always fun to read about—as is her ever-changing granny, the many wolves of the book, and other memorable characters. You’re bound to select one of the many tales as your favorite new telling of the classic story (spoilers ahead). My favorite story is more about the grandmother than anyone else. She is a widowed woman who lives alone, and wants to stay that way. A man is after her money by marriage, and her son worries she is too old to take care of herself. She ends up adopting a wolf who protects her from both, in different ways, and silliness ensues as her relationship with her new guard/pet molds to fit the classic story, however slightly and skewed it is. Last year I saw a little girl dressed as “Little Dead Riding Hood” for Halloween and I thought it was the cleverest costume ever. I look forward to reading many other versions of this tale throughout my lifetime—perhaps I’ll even tell a few of my own—but I would definitely recommend Vande Velde’s collection to enjoy right now.